Notes: Pant Salop was situated on the Cambrian Railway (CR) main line that linked Aberystwyth and Whitchurch. The section of line on which the station was located was opened between Oswestry and Pool Quay by the Oswestry & Newtown Railway (O&NR) on 1 May 1860. The lines was extended to Welshpool on 14 August 1860 and through to Newtown on 10 June 1861. On 25 July 1864 the O&NR merged with the Llanidloes & Newtown Railway, the Oswestry, Ellesmere & Whitchurch Railway and the Newtown & Machynlleth Railway to form the CR (which also absorbed the Aberystwyth & Welch Coast Railway [sic] in 1865). The merger of the companies created the through route between Aberystwyth and Whitchurch. 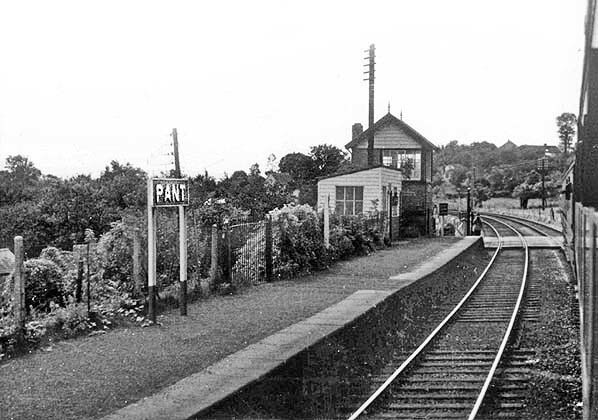 The O&NR opened a station at Pant in February 1862. It was located on the eastern edge of its village namesake on the western side of the Montgomery Canal. A small lane, which became Station Road, crossed the line at this point by means of a level crossing and the station was situated on the north side. At the time of opening the line was single track and the station was provided with a single-storey building under a pitched roof, with its gable end facing the railway. The window openings had shallow segmental arches. The structure was probably of brick, but in later years it was rendered. The building was located on the west side of the line adjacent to the level crossing. There was probably only a simple low level platform at this time also located on the west side of the line. A tramway which pre-dated the railway linked a quarry at Crickheath Hill to the Montgomery Canal at Pant and to serve it exchange sidings were laid out at the station. They were located on the west side of the line to the south of the level crossing. At the time of opening passenger trains ran between Oswestry and Newtown. There were six trains in each direction on Monday-to-Saturday and one each way on Sunday. In the second half of 1863 work began on doubling the main line between Oswestry and Llanymynech and it was completed by 15 February 1864. At Pant two new platforms were provided. The original platform served the up (Oswestry direction) line and new down (Newtown direction) platform was provided. During the 1890s improvements were made along the CR main line which resulted in better timekeeping and faster services; however the average speed of an express train between Whitchurch and Aberystwyth was still only 28mph. In 1893 an additional building was provided on the up platform and both platforms were rebuilt. The new building was located to the north of the original and was an austere single-storey structure in brick, with rectangular openings and a pitched slate roof. Minor decoration consisted of a finial on each plain bargeboard and splayed chimneystacks. Around this time a signal box also opened at Pant. It was located at the south end of the down platform. The down platform also gained an enclosed timber waiting shelter beneath a pent roof. The December 1895 timetable showed five up and four down trains on Monday-to-Friday. There was an extra up train on Monday and an extra down on Wednesday. Four of the up trains and three of the down stopped by request only. On Sunday there was one train in each direction which stopped by request. In 1913 the quarry and its tramway closed. On 1 January 1922 the CR was taken over by the Great Western Railway (GWR). The July 1922 timetable showed five up and seven down trains on Monday-to-Saturday as seen in the table below. There was an extra down train on every Monday and two on the first and third Monday of the month. There was an extra down train on the first and third Monday of the month, an extra train on Thursday and two extra trains on Saturday. No trains called on Sunday. On 1 July 1924 the station was renamed Pant (Salop). This was to distinguish it from Pant (Glam) and Pant Halt near Wrexham. During the 1920s the GWR made improvements to the former CR line which speeded up journey times. On 1 January 1948 Pant (Salop) became part of British Railways [Western Region]. The 15 September 1958 timetable showed nine up and ten down trains on Monday-to-Saturday. One of the down trains did not run during school holidays and no trains called on Sunday. On 1 January 1963 Pant (Salop) passed to the operational control of British Railways [London Midland Region] (BR[LMR]). Three months later the Reshaping of British Railways report (the ‘Beeching Report’) was published. It recommended the withdrawal of all passenger trains between Buttington and Whitchurch and complete closure of the line between Buttington and Llynclys. The intention to withdraw passenger services was published on 11 March 1964, and the TUCC report on the closure hearings was received by Ernest Marples, Minister of Transport, on 13 July 1964. His consent to the closure was announced on 11 September 1964. On 6 July 1964 the goods facilities at Pant closed. The timetable of 7 September 1964 showed nine trains in each direction on Monday-to-Friday. There was one less train in each direction on Saturday. The last train called at Pant (Salop) at 9.19pm on Saturday 16 January 1965. It was a Saturdays-only service from Oswestry to Welshpool. The line between Buttington and Llynclys closed completely on 18 January 1965. The track through Pant was lifted later that year. 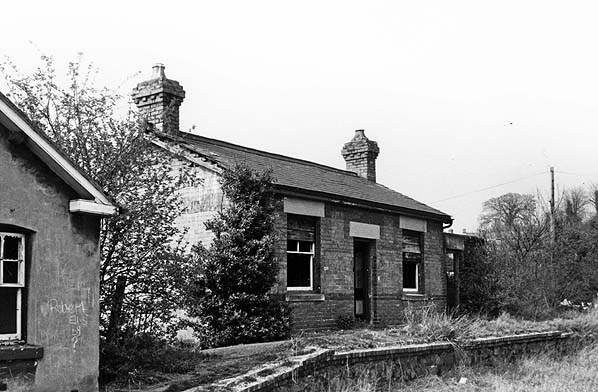 The station buildings and platforms were still standing in August 1978 but were demolished shortly after, sweeping away all trace of the station. 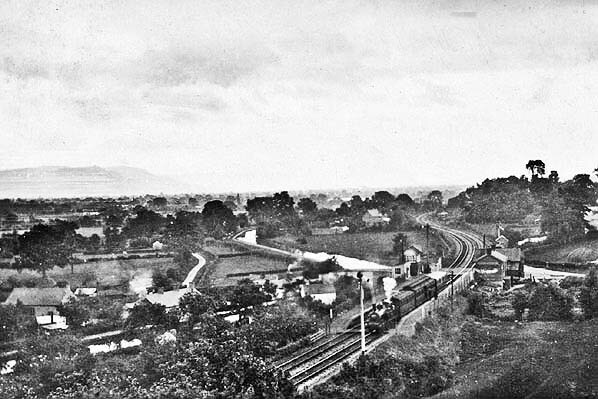 Pant (Salop) station looking south from an elevated position in 1925. An up local passenger service is seen departing from the station. Pant station shown on a six-inch scale map from 1874. The tramway that linked the canal and the railway to Pant Quarry is seen passing under the CR line just to north of the station. The transhipment sidings are also shown to the south of the station. Pant station shown on a 1:2,500 scale map from 1874. Pant station shown on a 1:2,500 scale map from 1901 in the period after it had gained an additional building on the up platform and a waiting shelter on the down. A signal box had also been added. Looking south at the Pant (Salop) down platform from an up direction train in 1954. 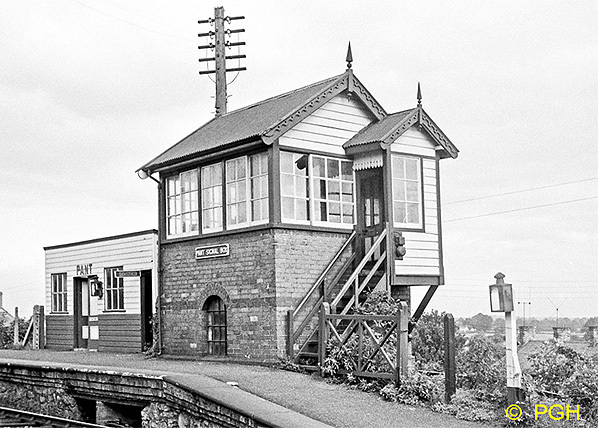 Pant signal box seen in October 1962. The box was located at the south end of the down platform. 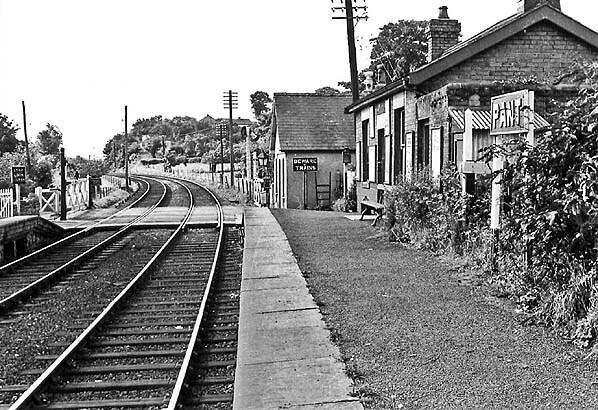 A view looking south along the up platform at Pant (Salop) in the early 1960s. 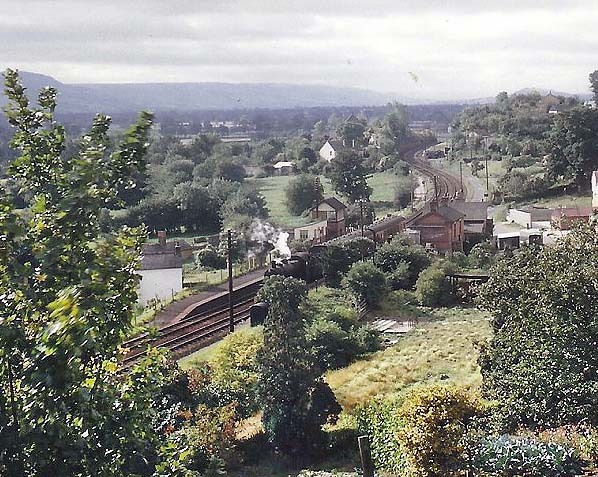 Pant (Salop) station seen in the early 1960s from the same elevated position as the 1925 photo at the top of the page. Very little had changed over nearly four decades. 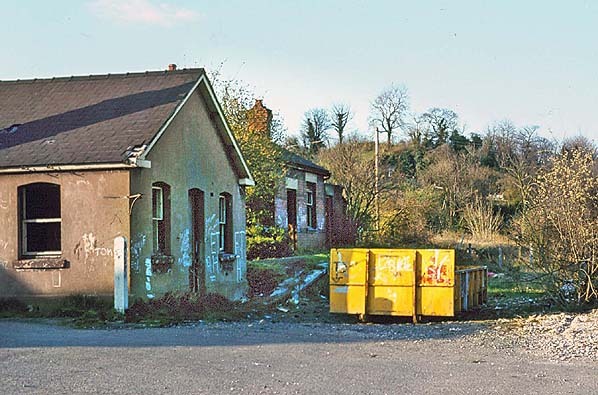 The derelict station buildings at Pant (Salop) seen in 1974. A view looking north at the site of Pant (Salop) station taken on 5 April 1978. The station was still standing at this time. 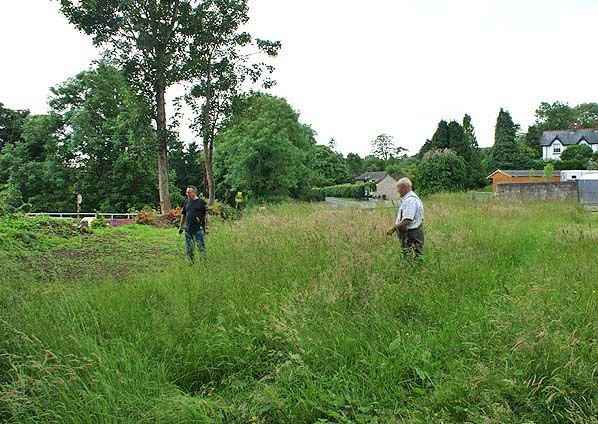 Looking south at the site of Pant (Salop) station on 28 June 2013.